Yesterday, we revisited the NATO MISSILE FIRING INSTALLATION (NAMFI) for a tour of their base and facilities. We also had an opportunity to visit their beautiful beach that was quite relaxing. Prior to yesterday we had visited NAMFI for a ceremony commemorating their 48th Year Anniversary. While there for a tour we were also briefed of their member states, initiatives, and current endeavors. As a gift we were all given a NAMFI cap (pictured in the top left). On our way back from viewing the firing field (pictured at the bottom) we had an opportunity to stop and view their mini museum which displayed their collection of drones from domestic and international patrons (pictured in the top right). 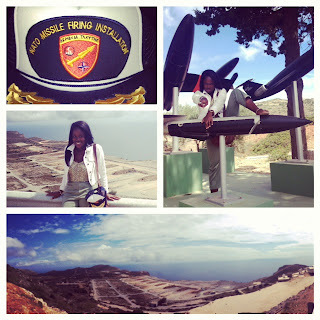 It was a great joy visiting the base, their staff was very friendly and accommodating (as is everyone in Crete).